Precious little seems as dynamic these days as the changing face of search engine optimisation, SEO. Once upon a time it used to involve stuffing the keywords with every possiblity, including spelling mistakes. Google has grown up a lot since the early days and now it is a more honorable skill to improve a website’s appearance in searches. A much used term which likens SEO to something out of a spaghetti western – SEO either sits on one extreme or the other of techniques to garner attention Google. Black hat SEO are bad, very bad methods of increasing your Google presence – from backlinks to keyword spamming, anything that is even a slightly bit dodgy can cost you in the long run. 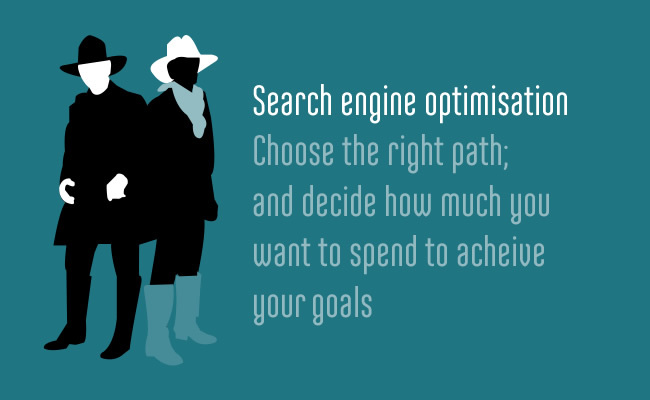 Good methods of SEO are grouped together under the big ‘white hat’. Keeping the content unique and new, increasing relevant keywords and more recently, engaging them for longer maintaining their interest in your website. Employing any of the black hat methods can cost you dearly. Relatively recently backlinks got a hugely positive advocacy, people paid £5 for 100 links back from random websites and it did affect the webstats. Penguin put paid to that. Every change in algorithm wields a harvest of dismay for many website owners – not all of them even partaking in dubious means to improve their search ranking. SEO is not an exact science and rumours fly around, “keywords don’t make any difference” – “page rank doesn’t count any more” etc etc. Looking at the changes in Google’s algorithms each one seems to try and shake off the spammers, or that’s the impression we are given. Perhaps then we should try to please our visitors to our genuine and above board website. Our clients don’t want to spam anyone – they truly want to show off their wares, perhaps collecting email addresses so they can share their latest news via a useful medium and get their latest offers into peoples line of sight. With that in mind we take a very honest approach to improving your websites visibility in searches. If an SEO company claim they can get you on the first page of Google, make sure they specify for which search term – shady techniques are still going on, and people are still paying for them (in more ways than one). We have had clients recount horror stories about the prices they have paid for SEO – if they have had anything done for their company then that would be a bonus – companies sit inactive on accounts, they speak to a different account manager every time they call up and rarely see anything of the media company other than a remittance slip every month. Many websites that occupy the top spaces have not been maintained or updated for a while. This does mean that any changes made to your website will have a noticeable effect, some websites do have a false bump up the charts when any changes are made and the best way to measure improvements is over 6-9 months of monitoring. We recommend a long-term plan for SEO, whatever your budget – it is better to plan for a year with a multi-pronged attack that consists of URL structure reviews, page titles and descriptions, page speed, articles and posts, social media and creating new pages.